On April first I started out the month by seeing my first Great Blue Heron of the year in stream along County Road 7 in Washington County. They'd been seen on the river in Stillwater for a few weeks now but with water slowly starting to open up elsewhere I finally spotted one. Wednesday, April 2nd I saw my first Turkey Vulture of the year on the way home from work. I thought I saw a wood duck too but I thought better than to slam on my brakes on a busy road and flip a u-turn. I had done exactly that about 10 miles back where the road was more rural but I was only a mile from hwy 36. The reason I turned around before was that I caught a glimpse of a large hawk on the passenger side of my car and in the rear-view mirror I could see that it had landed on a fence post. The hawk looked HUGE and at first I thought there was no way it could be a red-tail. It flew off though and sure enough, there was a big old red tail. It must have been a large female. Since I made great time with traffic, I also stopped in quickly at Harriet Alexander Nature Center for a quick stroll. I saw cardinals, robins and red-winged blackbirds but I was even more excited to get a pretty good look at a northern shrike. Out in the middle of the wetland area I also came upon a beautiful flock of common grackles. When I looped back past the building a heard a noise back out near the edge of the wetland and brought up my binoculars. I saw a blue jay. The sound didn't seem right though. I soon found out why. The northern shrike was in the same tree and he was pissed off about the blue jay. He keep chasing him out of the tree. Blue Jays are big but he kept his distance. Don't mess with shrikes. Funny thing though. He kept on coming back. The fight between the two was really interesting. The next morning I had to run some work related errands and saw a pond in Stillwater full of geese, gulls and two-tone ducks I am assuming were ring necks but I only caught a glimpse and there was no where to pull over. Just as I arrived to work I got a good look at a pair of sandhill cranes in farm field by the entrance. They looked funny pecking at hte ground with their showy plumage sticking up in the air. Not the "classic" sandhill pose to be sure. Before lunch I had a meeting in the library at work and I realized after the meeting I had left my laptop computer behind. I went back in the room to get the computer and when I looked up I saw a bird land on a branch outside the window. I immediately recognized it. The Eastern Phoebe! We've been waiting for this bird to show up for weeks. We all guessed and were terribly wrong. My guess was that it would return on March 22 (same day as last year) but it was much later this year. It was lunchtime so I quickly made my lunch and went over to the windows to watch for the bird and snap a photo. It didn't show but this bird did! I had to really crop and zoom as this camera isn't the best and it isn't really in focus either. 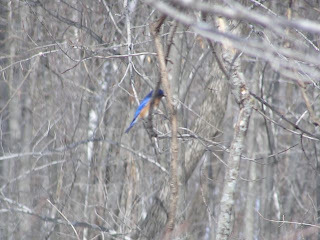 You can still tell it is an Eastern Bluebird though. Wonderful! Paul had spotted one last week so I was excited to see it. The colors were fabulous. I love spring! He flew off right away and I only got this one photo. A little later in the day I saw yet another first for the year. A lone pine siskin was hanging out with the goldfinches at the feeders. It really threw me for a loop. I was thinking, "that's way too small for a female purple finch." Paul suggested pine siskin and it all made sense. What a great day for birds. They seem to know spring is finally here. We also pulled hte last of the maple taps today. I have photos and I'll post some in a couple of days.